Biography of Abstract Painter, Founder of Orphism/Simultanism. A pioneer of modern art of the early 20th century - in 1912 he was the first French artist to paint wholly abstract art - Robert Delaunay opened up the possibilities of non-representationist painting with his invention of Orphism - a style which combined elements of Cubism and Fauvism with the motion of Futurism, and which explored the abstract qualities of colour. He also explored the effects of the "Law of Simultaneous Contrast of Colours," pioneered by the 19th century French chemist Michel-Eugene Chevreul. His most famous works include: Tours de Laon (1912, National Museum of Modern Art, Paris); Simultaneous Windows on the City (1912, Hamburg Art Gallery); Champs de Mars: La Tour Rouge (1911-23, Art Institute of Chicago); The Eiffel Tower (1910, Guggenheim, NY); Sun, Tower, Airplane (1913, Albright-Knox Art Gallery, Buffalo); and Simultaneous Contrasts: Sun and Moon (1913, Museum of Modern Art, NY). An influential figure in early 20th century French painting, his work had an impact on abstract painters as well as semi-abstract artists, including certain German Expressionists, the Italian Futurists and the American Synchromists. 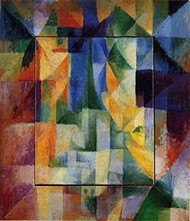 Delaunay also influenced a number of abstract art movements. However, this influence declined after 1920. The French painter Robert Delaunay began his artistic career as an apprentice to a stage designer in 1902. In 1904, he turned to painting, initially in the style of Impressionism, but soon moved away from more traditional practices in order to explore the abstract qualities of colour. By 1905 he was painting in large patches of bright colour in the manner of the Fauves. During the period 1908-10, he made his own contribution to Analytical Cubism by producing Cubist-style works with vivid colours instead of the fashionable browns and greys of Picasso (1881-1973) and Braque (1882-1963). His subjects also differed: he chose dynamic urban imagery rather than the more conventional but static still-life forms. 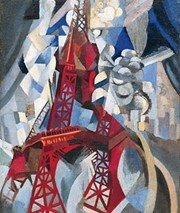 This is exemplified in his series of pictures of the Eiffel Tower, such as The Eiffel Tower (1910, Guggenheim Museum NY) and The Red Tower (1912). Moving to complete abstraction in 1912, he joined the Section d'Or group and - along with Albert Gleizes (1881-1953), Francis Picabia (1879-1953), Marcel Duchamp (1887-1968), Jean Metzinger (1883-1956), Fernand Leger (1881-1955), and others - showed at the Galerie la Boetie. The following year his painting was shown at a one-man exhibition in the prestigious Sturm Gallery in Berlin (founded by Herwarth Walden), to great interest from painters like Franz Marc (1880-1916) and Kandinsky (1866-1944), as well as Paul Klee (18791940), and Marc Chagall (1887-1985). Delaunay's style at this time featured loosely painted patches of rainbow colours laid out in overlapping planes of contrasting or complementary hues, which the art critic Guillaume Apollinaire (1880-1918) interpreted as having a 'musical effect' and dubbed it Orphism or Orphic Cubism. (Orpheus was a mythological musician of ancient Greece.) Another exponent of Orphism, whose abstract painting had a considerable influence on Delaunay, was the French-Czech painter Frank Kupka (1871-1957). Delaunay himself preferred the term Simultanism (an idea elaborated by the French philosopher Henri Louis Bergson) to characterize his work. A good example is La Ville de Paris (1912; Musee d'Art Moderne de la Ville de Paris). Both Delaunay and the Italian Futurists explored this idea, which contends that the world impresses itself upon the consciousness as fleeting, intuitively understood sensations. In La Ville de Paris, Delaunay was not concerned to depict how Paris looked, but how it felt from minute to minute; he indicated the speed and pressure of life in a big city with overlapping and fragmented forms including an iron bridge and the Eiffel Tower. "Simultaneity" was seen as a particularly appropriate description of modern life, and Delaunay painted a series of views of contemporary Paris which conveyed a sense of urgency and movement, as in The Cardiff Team (1912-13; Van Abbe Museum, Eindhoven). After 1912 this dynamism changes to more regular rhythmic form: rectangular shapes in the Fenetres series, and circular shapes in the Disks. Many of these abstract paintings contain an insistent strain of cosmic symbolism. Brilliant light and colour are enhanced by "simultaneous contrast", an effect of juxtapositioning in which colour is a primary element. Earlier forms of this colour theory included Georges Seurat's Pointillism, a form of Divisionism previously studied by Delaunay himself before rejecting it in favour of larger areas of interacting colour. In 1910 Delaunay had married the Russian artist Sonia Terk, and she too used Orphism as the basis of a style of decoration. When World War I began, Delaunay and his wife were holidaying in Spain, and they opted to remain with friends in Portugal for the duration of the conflict. While on the Iberian peninsula, the couple took on several projects, including costume-design for the Madrid Opera, and they also began a fashion design business. Returning to Paris in 1921, Delaunay continued to work in a mostly abstract style, but his work became stiff and lacking in spontaneity. He painted large mural paintings such as the Ville de Paris (1925; Exhibition of Decorative Arts, Paris), and a gigantic Rhythm in the Hall of Air for the 1937 Paris International Exhibition. In 1940 Delaunay contracted cancer, from which he died on 25 October 1941 in Montpellier. Works by Robert Delaunay hang in many of the world's best art museums, including: the Albright-Knox Art Gallery (Buffalo, New York), the Art Institute of Chicago, the Berkeley Art Museum, the Guggenheim Museum (New York), the Museum of Modern Art MOMA (New York), the Philadelphia Museum of Art, the Fine Arts Museums of San Francisco, the Honolulu Academy of Arts, the Bilbao Fine Arts Museum (Spain), the National Museum of Serbia (Belgrade), the Kunstmuseum Basel (Switzerland), the Peggy Guggenheim Collection (Venice), the Tate Collection (London), and the National Gallery of Victoria (Melbourne, Australia), and others.  For more biographies of French abstract artists, see: 20th Century Painters.  For more information about abstract art movements, see: Homepage.